Special Correspondent ● Kolkata: The city gets a taste of true craftsmanship with a rare exhibition, called Colours of Freedom, by veteran artist Rabin Mondal at Gorky Sadan. The nine-day exhibition began with screening of a documentary, Rabin: The Inner Soul, (Dir: Arun Kumar Chakraborty) made on the artist on 12th August evening. Renowned personalities like Ashok Mitra, Sankha Ghosh, Soumitra Chattopadhyay, Ganesh Haloi, Sunil Das, Pranab Ranjan Ray and Buddhadev Das Gupta were present at the inauguration ceremony. The objective of the exhibition was to celebrate the 68th anniversary of Indian Independence. 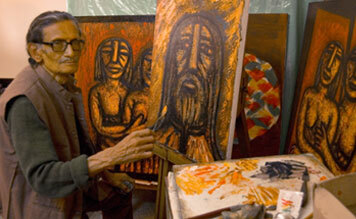 The intensity and depth of Mondal's works have always made him different than his other contemporaries. His works are known for exhibiting passion for life and nature. The artist is a true exponent of figurative sketching. He is inspired by the Western as well as the Eastern masters like Picasso and Matisse and Abanindranath Tagore, Nandolal Bose and Jamini Roy. Kolkata is hoping to host more such exhibitions in the future. Despite its limitations, the city is here to offer its best infrastructure to artists so that it does not fall short of any other art hubs of India. With more and more artists coming to the city with their works we must remain persistent to the task.